The general election which was held during August and September 1727 had been unexpected, being brought about by the sudden death of George I. The timing of the election caught William Pulteney off guard and demolished his plans to confront Robert Walpole with a strong opposition in the constituencies in the election anticipated for 1729. His next opportunity would not now be until 1734. George II had quickly recognised the strengths of his father’s chief ministers, Townshend and Walpole, and kept them in office. But during the next seven years Walpole and his ministry would be tested to the limits by the emergence of a formidable parliamentary opposition. The 1727 election produced a House of Commons consisting of 427 Whigs and 131 Tories, marking a sharp fall in the number of Tory MPs who had sat during the previous Parliament. There were fewer contests, too: 114 compared to the 154 in 1722. Both sets of figures reveal the degree of Tory unpreparedness for the election and the low state of Tory morale. Of the 24 disputed elections considered in the opening session, the returns for Flint Boroughs, Montgomery Boroughs and Hindon were among the most hotly contended. Sir Spencer Compton, who had been Walpole’s rival for power in the weeks following George I’s death, stood down from the Speakership of the Commons at the beginning of the first session and was elevated to the Lords. His successor was Arthur Onslow who was to occupy the position without interruption until 1761. The large number of Whig MPs was naturally dominated by supporters of the government. They included some 180 office-holders of various kinds – the ‘court and treasury party’ – plus others who were obligated to the ministry for their parliamentary seats or other favours. Additional support was also forthcoming from large numbers of ‘independent’ Whigs with no direct ties with the ministry. These MPs were usually very wealthy and had been elected on their own ‘interests’. William Pulteney’s ‘discontented Whigs’ – who thought of themselves as taking a ‘patriot’ stand against the ministry – numbered no more than about 15 at the outset of the 1728 session. But by the close of proceedings in 1730 Pulteney’s following had increased to over 80. He and his close colleagues developed tactics of regular and relentless attack on the ministry across a range of issues, such as the alliance with France, the standing army, the cost of employing Hessian troops to defend Hanover, and the failure to protect British shipping against Spanish attack. Much new opposition support came from independent Whigs who were attracted by Pulteney’s damning criticism of Walpole’s policies and his corrupt style of government. But many more independents who did not go into outright opposition became less dependable allies of Walpole and increasingly difficult to manage. Despite a combined numerical strength of 160-170, the ability of discontented Whigs and Tories to act jointly in opposition was often circumscribed by underlying antipathy, much of which revolved around their conflicting party ideologies. Tory attendance was a particular problem. In February 1730, however, the effectiveness of concerted opposition was spectacularly demonstrated when the Tory leader, Sir William Wyndham, launched a surprise attack on the ministry for seemingly having allowed the French to reconstruct their harbour at Dunkirk contrary to the 1713 treaty of Utrecht. Over the next three sessions patriot Whigs and Tories found a sense of common purpose through their participation in parliamentary inquiries into a series of lurid financial scandals. The focus on ‘corruption’ had become a strong theme in Commons debate, and was also taken up in the Lords where the chief opposition spokesman was Lord Carteret. In 1733 Walpole failed to carry the Commons in his highly controversial ‘excise scheme’ and the defection of many usual supporters brought the ministry to its knees. Walpole was only saved by the King’s prompt dismissal of leading opponents in the Upper House from their positions at court, which signified continuing royal confidence in him. In the final, short session of 1734, prior to the general election, the opposition harassed the ministry over issues which did more to expose their own internal quarrels and divisions. The ministers nevertheless went to the polls with feelings of uncertainty. 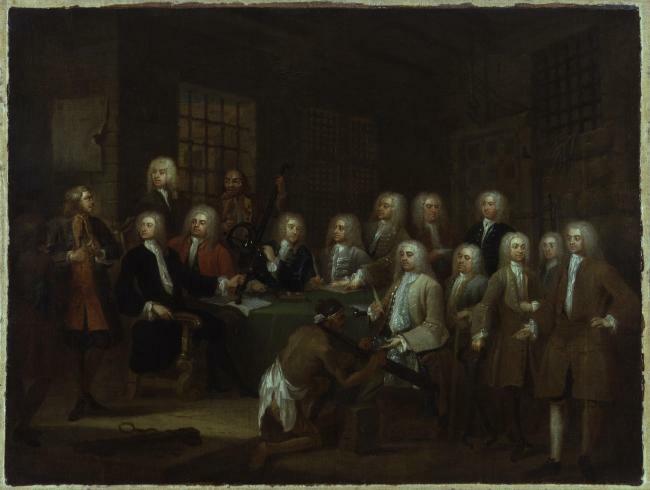 An unusual record of parliamentary activity from this Parliament was provided by William Hogarth in his painting of the Gaol Committee of 1729 (in the National Portrait Gallery). The committee was established to investigate the deplorably inhumane conditions of London’s main debtor gaols, and was one of the first widely publicised ‘social’ investigations conducted by Parliament. 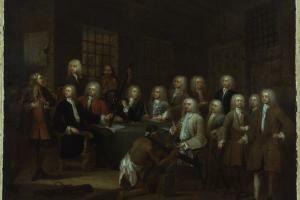 The painting shows the committee’s chairman, James Oglethorpe, and a gathering of twelve other MPs hearing evidence in a prison room. The other MPs are thought to include the parliamentary diarist Viscount Perceval, William Hucks, Sir Archibald Grant, and Hogarth’s father-in-law, the King’s Serjeant Painter, Sir James Thornhill.